Hi guys!!!!! 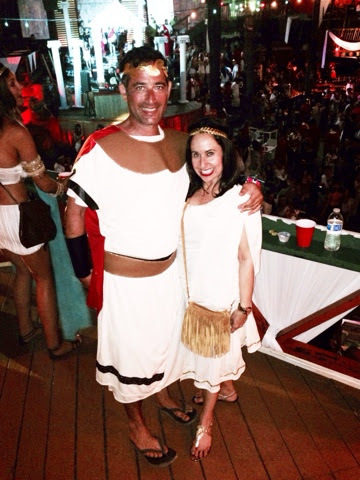 Jeff takes me to this amazing event every year in Rosarito Beach Mexico that is so much fun. We are good friends with the owners of Papas and Beer, a restaurant and bar in Rosarito Beach and Ensenada Mexico. 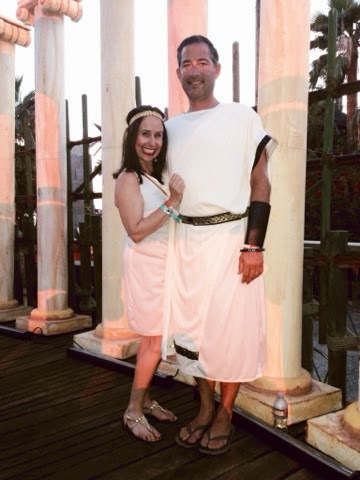 They host an anniversary party every summer and this year's theme was Greeks and Romans. We brought my friend and photographer Cathy with us (unfortunately her husband had a work function and couldn't come). It is the biggest party I have ever been to -- nine thousand people!!!!! 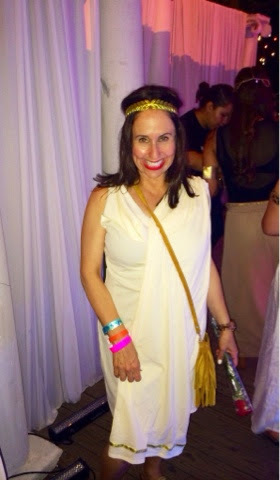 I wore a basic white toga costume and added a cute gold headband and gold Dolce Vita sandals. 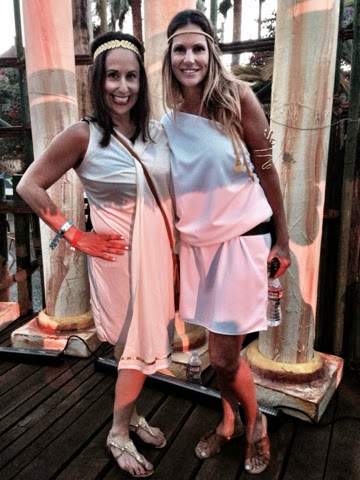 It is always so much fun dressing up for theme parties no matter what age you are. This is my favorite party of the year and it's a great time to spend a few days in Mexico hanging out with our friends at Papas and Beer. If you have never been there it is one of the most fun restaurants/bars I have ever been to. 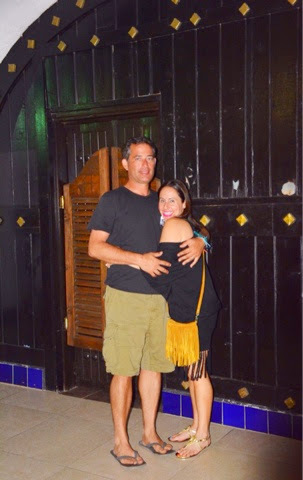 So next time you visit Rosarito Beach, don't forget to stop by Papas and Beer, especially in the summer for the anniversary party. I know you will have as much fun as we always do. Thanks to Cathy Cordas for photos and editing and don't forget to follow me on Instagram (@everythingevelyne), Facebook and Bloglovin. Happy reading!!!! Hi guys!!!! I just love Mexico, especially Rosarito Beach. 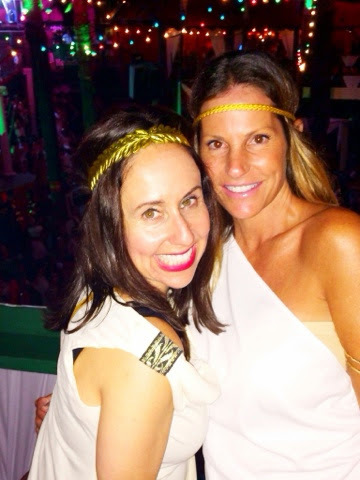 My husband takes me to an event there every July (which I'll be blogging about later) . It is such a rustic and beautiful city. This year my friend Cathy came with us. 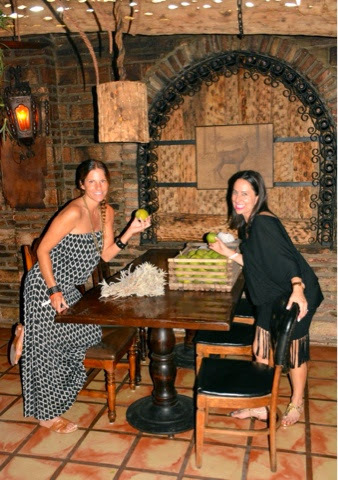 On our first night we went to an amazing restaurant for dinner called El Nido. It is one of my favorites. 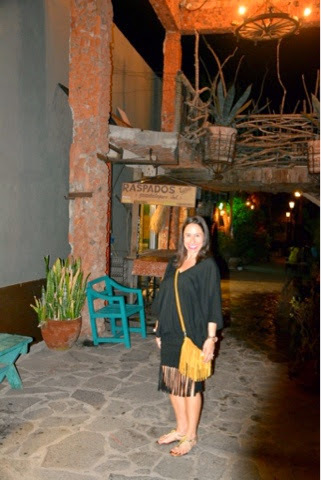 Since it is so casual in Mexico I decided to wear a black Indah dress with a fringed bottom and gold Dolce Vita Sandals. I've talked about Indah before and it's one of my favorite clothing lines. I love how the pieces are unique with a bohemian vibe. I thought this would be a perfect vacation dress. I especially love the fringe on the bottom. My little yellow travel purse also has fringe on it. 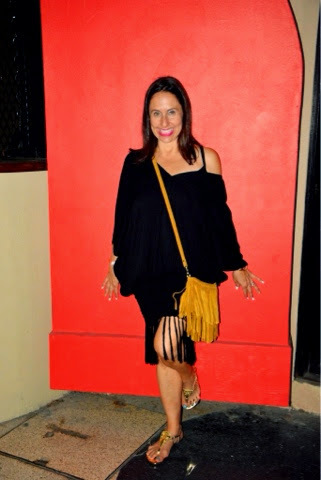 Fringe just makes a basic black dress more fun and hip. Have any of you embraced the fringe trend? I'd like to hear about it!!!! Keep posted for more Rosarito Beach posts and the big event we came for. You won't wanna miss it. Thanks to Cathy Cordas for photos and don't forget to follow me on Instagram (@everythingevelyne), Facebook and Bloglovin. Happy reading!!!!! Hi guys!!!! I'm excited to share my writing debut (and Cathy's photography debut) for the Los Angeles Register, which was published August 17th. We were asked to find women with great style and photograph and interview them about their outfits. 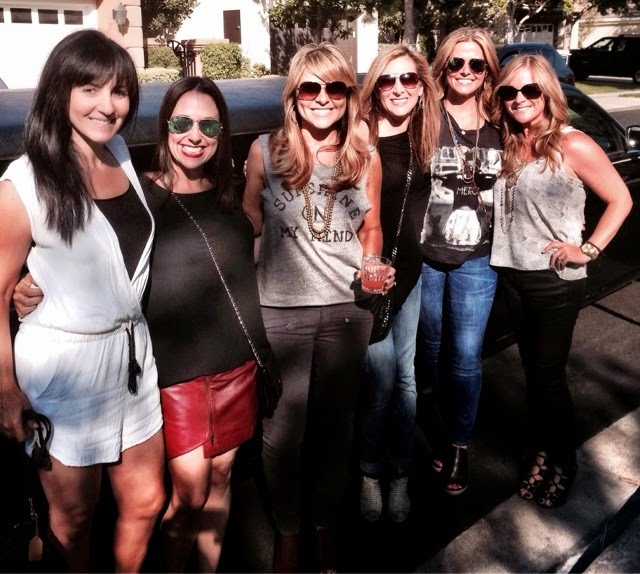 We went to the Commons in Calabasas and found five women with great styles and personalities. Cathy and I at the Commons ready to start the photo shoot. 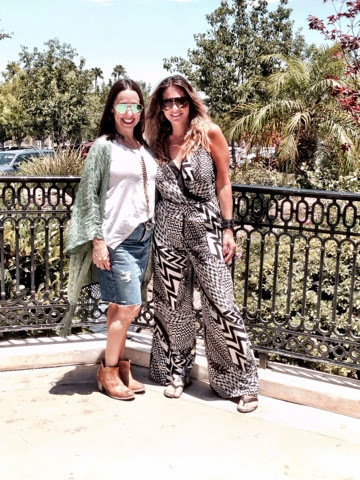 Stacey Pomerance Maiman wearing an adorable jumpsuit by Vavavoom, Zoom wedges and Amanda Jordan bracelets. Dani Kaplan (with her daughter Morgan) wearing Lululemon yoga pants, A target tank and Nike tennis shoes. 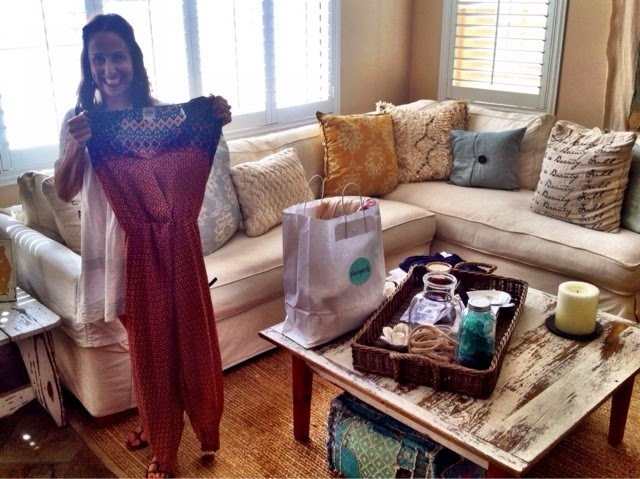 Kellie Singer wearing a Kimchee Blue cream Romper from Anthroplogie, Topshop wedges and Ooh by Paula Jewelry. Kellie and Stacey getting ready for lunch at Marmalade cafe. 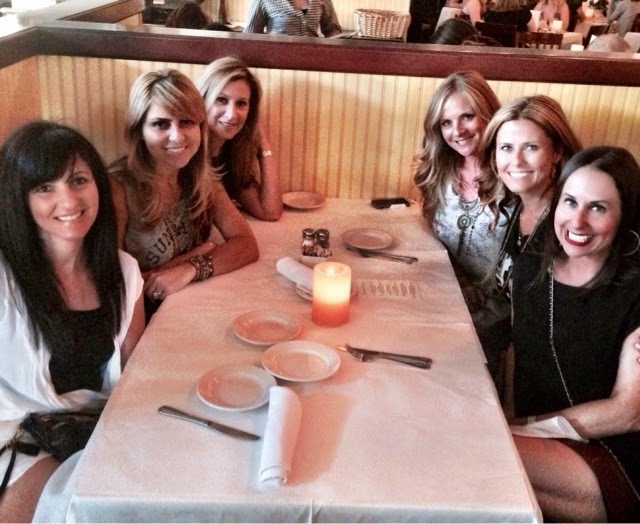 Cathy and I were so lucky because we found five women with great styles and personalities. Some women were shopping at Barnes and Noble or having lunch at Marmalade Cafe, while others were shopping across the street at Blush Boutique (one of my favorites). 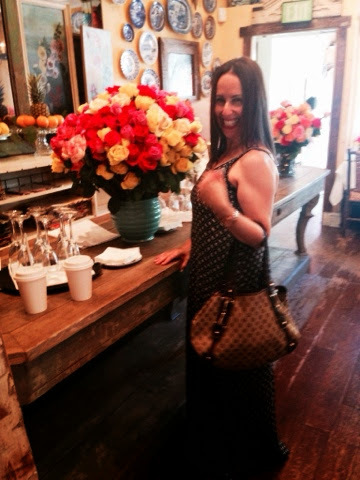 We had a fun day in Calabasas taking pictures and interviewing beautiful women about their great outfits. Let me know if you ever go to Calabasas and what your favorite things are to do there. Check out the Los Angeles Register and don't forget to follow me on Instagram (@everythingevelyne), Facebook and Bloglovin. Thanks to Cathy Cordas for photos and editing!!! Happy reading!!! Hi guys!!! 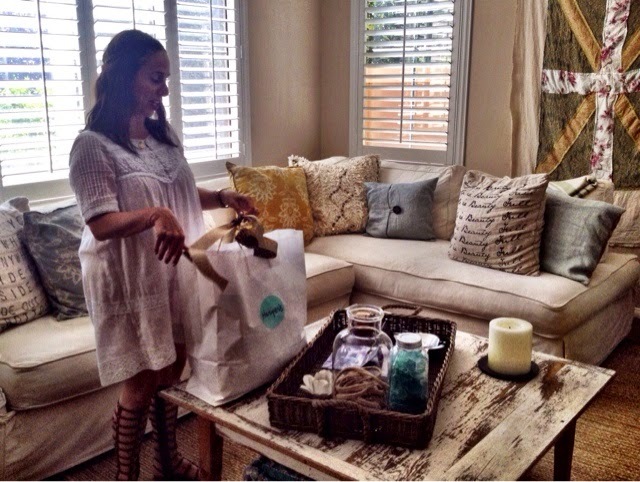 I wanted to share with you a new service from one of my favorite Orange County boutiques, Harper's in Corona del Mar. I love shopping at Harper's. Erica Thomas, the owner and a good friend, knows my style and likes, and always gives me a unique shopping experience by showing me items that best fit my style and personality. 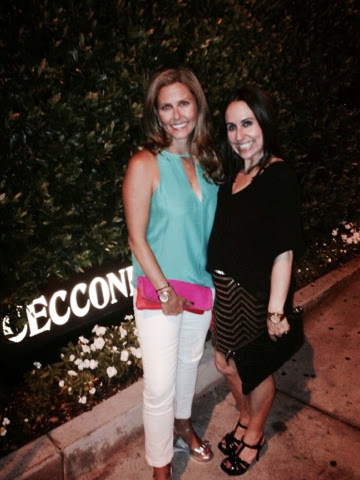 As a busy mom, I love staying on trend while being comfortable--embracing comfort in style. I feel like Harper's always carries pieces that are fun and hip as well as comfortable for my everyday errands with the kids, or evening events such as date night, and girls night out. Erica is now providing a special styling service. 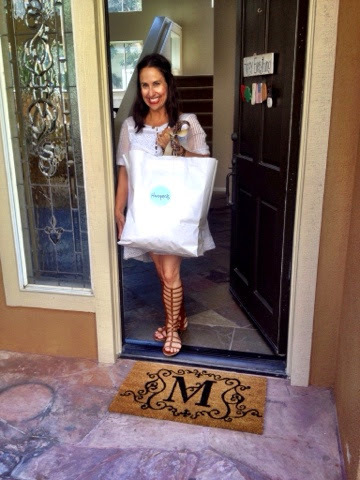 Based on a VIP form you complete about your style and likes, Erica and her team put together and deliver a package of items to your doorstep each week. You keep what you want and put the items you don't want back in the delivery bag which is picked up by Harper's the next day. I loved this idea and wanted to try it myself. I filled out my VIP form and a bag of the newest items were delivered to my door. I kept what I liked and the rest were picked up from my house. I can't wait to have this bag delivered to me every week. It's like opening presents and it's not even my birthday!!! The best part about the program is how Erica uses her style experience and puts these items together based on your personality. So I hope you all try this VIP service and love it as much as I do. Let me know what you think and happy reading!!!!! Check out Harper's, on Instagram (@HarpersCDM) and Facebook (Harper's). Don't forget to follow me on Instagram (@everythingevelyne) , Facebook and Bloglovin!!!! Hi guys!!!!! 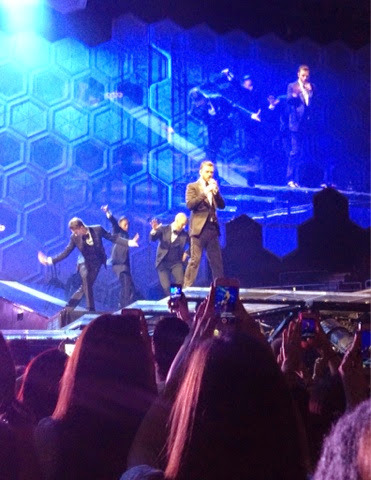 As most of my friends know I love Justin Timberlake and just saw him at Staples Center Tuesday night. It was incredible and one of the best parts was sharing it with my girlfriends. I have seen him in concert many times before and I must recommend to see him if you get the chance. He truly is an amazing performer. For this post I wanted to focus on all the girls and how beautiful they looked. Rita, Stacey, Jessica, Nikki and Julie all have amazing style and are fashion inspirations to me. Rita, Jessica and Julie decided to wear jeans and cute tops with booties and wedges, while Stacey wore an adorable white romper and wedges. I wore a red faux leather shirt by Leith, a Tildon black flowy top (both from Savvy at Nordstrom) and Isabel Marant booties. We had such a fun time-- taking a limo, eating a great dinner and singing and dancing to JT tunes all night!!! What concerts do you like to go to and what do you wear to them? Let me know by commenting and happy reading!!!! Don't forget to follow me on Instagram (@everythingevelyne), Facebook and Bloglovin. 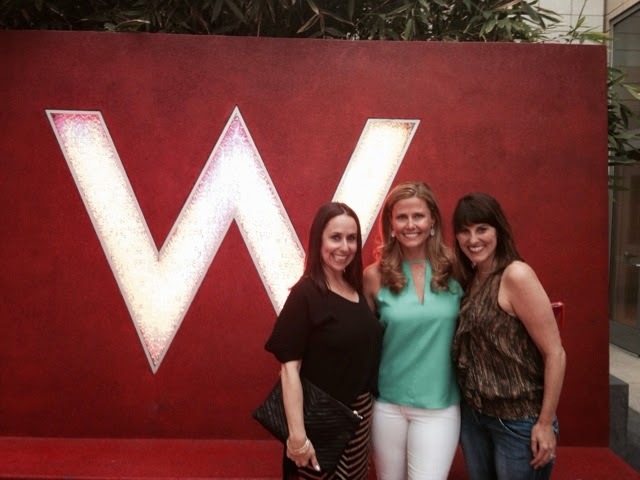 the second part of my LA adventure with my friends Jessica and Phoebe. 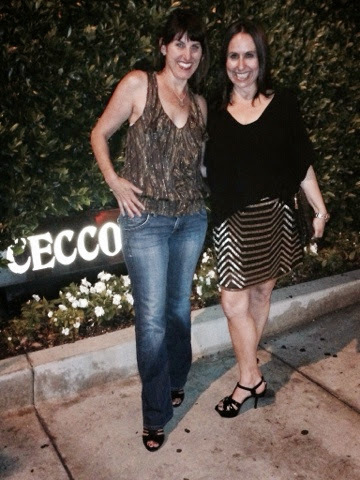 We ate dinner at the very hip spot Cecconi's in West Hollywood. The food was delicious and we had a great time catching up. I loved Phoebe' s Hudson jeans and Ella Moss tank top and Jessica's perfect white jeans and Parker turquoise top. 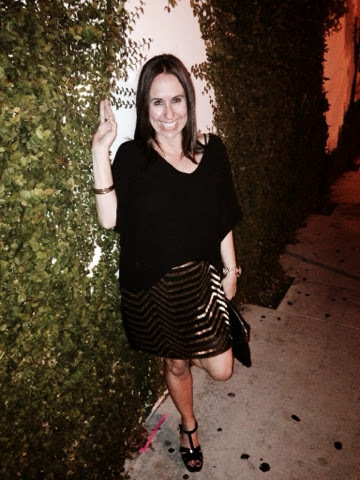 I decided to wear a Lush simple black top half tucked into an amazing new skirt I got from Nordstrom. I love tucking in a shirt part way into a skirt or some jeans to give a more slimming look. I love this skirt. It's by Raga. 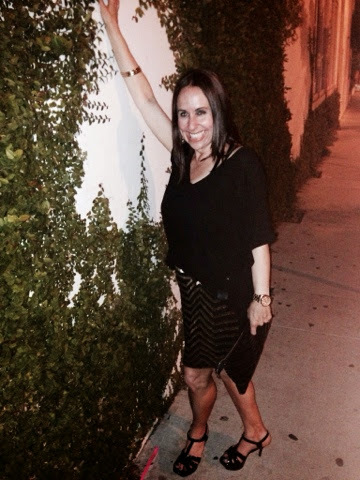 I added a great black clutch and my favorite Saint Laurent heels and my outfit was complete! 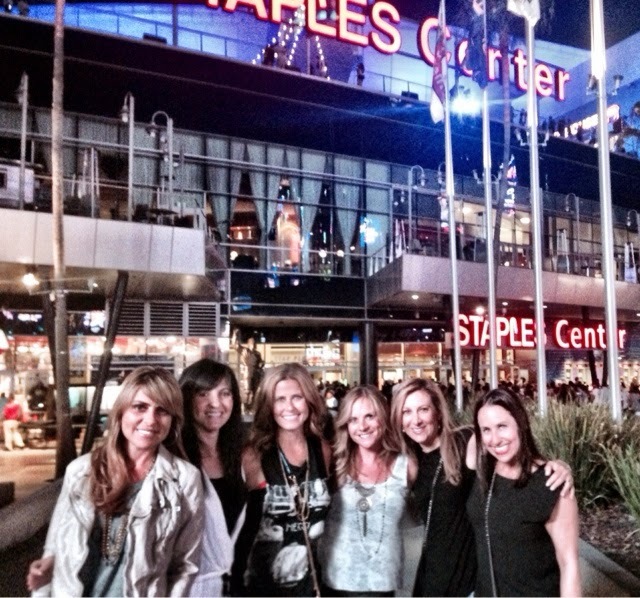 I love taking these fun trips with my girlfriends. Where do like like to go with your girlfriends? Let me know and happy reading!!! Thanks to Cathy Cordas for photo editing. Don't forget to follow me on Instagram (@everythingevelyne) , Facebook and Bloglovin. Hi guys!!!! Hope you are having a great summer. I sure am. I have been taking some fun trips which I will be sharing in future posts. 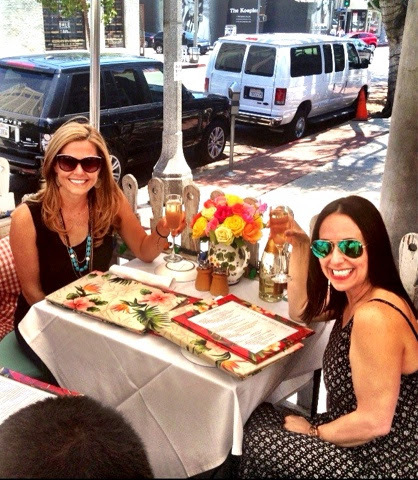 My first excursion of the summer was to LA with my best friend Jessica and our dear friend Phoebe. 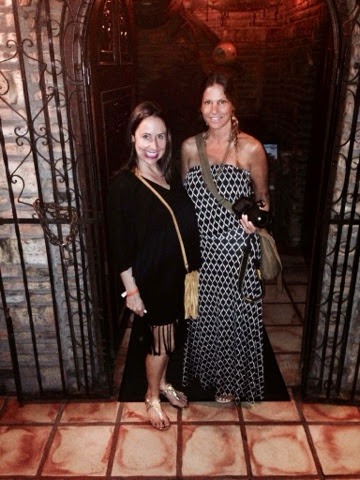 Our first stop on our adventure was the Ivy Restaurant on Robertson Blvd. Robertson is known for all of its eclectic shops and restaurants. I usually feature my outfits on my posts but this time I wanted to focus on the style and beauty of this restaurant. It has a stunning outdoor patio that is surrounded by a white picket fence. The inside has a beautiful ambience with floral patterns and fresh flowers everywhere. 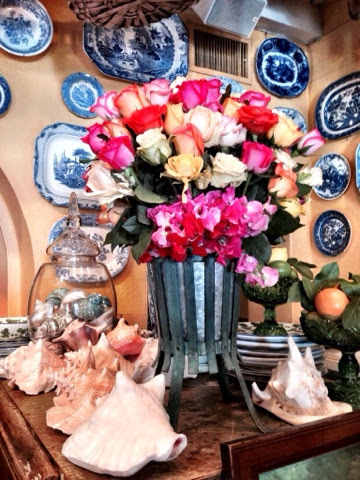 It almost feels like you are dining in someone's beautiful home. 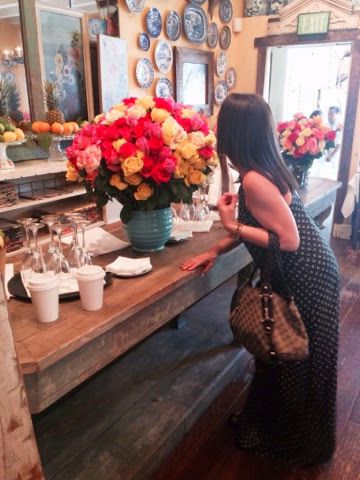 I love the rustic furniture and table decor. It is a beautiful setting inside and out. And the food is amazing--Jessica and I ordered chopped salads (one of my many favorites on the menu). 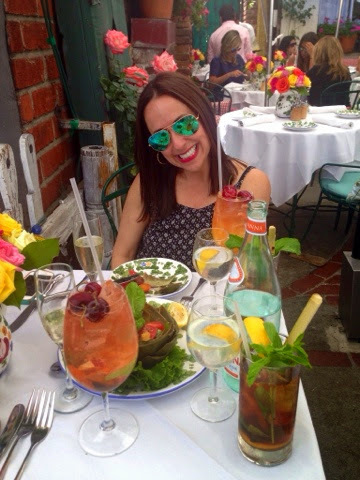 The Ivy is a must stop destination in LA. Whether its your first time here or you are a repeat visitor it is fun to sit and relax in the beautiful atmosphere. No wonder why Hollywood's biggest stars are spotted here often. What are some of your must stop places to visit in LA? Let me know and happy reading. Don't forget to follow me on Instagram (@everythingevelyne) , Facebook, and Bloglovin. Thanks to Cathy Cordas for photo editing!!!! 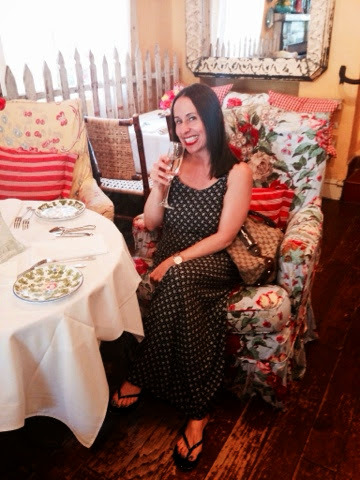 (And for those of you wondering, my adorable dress is from Social B in Newport Beach (@socialbboutque) from a line called Cotton Candy, Rayban Sunglasses that I am obsessed with and my Gucci purse).